Hey everyone! Can you believe the 4th of July is just a few days away? I thought last year went by super-fast, but this year is just flying by! I don't typically do a bunch of decorating for the "4th," for the simple fact that I don't have much in the way of "Patriotic" decor! That being said, I kind of wanted to add a little something, at least to the kitchen, but didn't want to completely change up my simple summer decor. Oh, and I also didn't want to spend any money to do this. 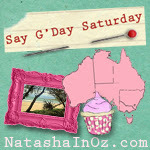 BTW, did you get my little play on words in my post title -- Summertime Vignettes With a Wave of Patriotism? Get it......flags, wave....get it? Of course you do! Okay, I will let you be the judge......is it enough? As you know from many previous posts, this is the view I see like a gazillion times a day, and I'm liking what I see. 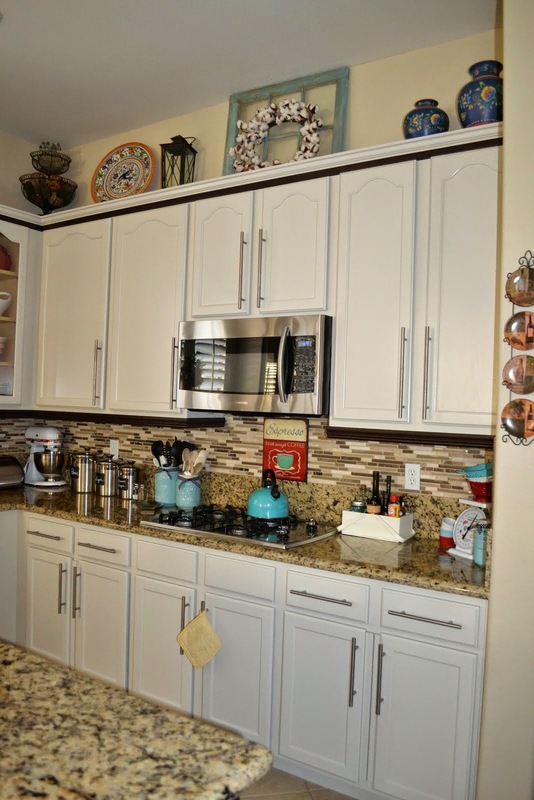 I love that our island is big enough to have a nice vignette but still have plenty of room for prepping or serving meals. The "Sassy Babes"......aka: Little Miss and Littliest Miss! I had this tucked away for Fall, but what could be more American than "Apple Cinnamon," right? Fiesta pitcher filled with small flags. Color-appropriate napkins and mugs for morning coffee. See my photo bomber.....my helper and sidekick! Don't they look real? Nope, this is as close to lilacs as I'm gonna get here in the desert. I happened into Joann's a couple of weeks ago, and found all of their floral bunches on sale for 70% off! I know, pretty sweet that it made these beauties less than $3 each! I might answer.......keeping it real and using what I have on hand! Can you smell them? I can! Well, okay, I can't but love 'em anyway! I always have a wreath on my pantry door, don't you? I made this a couple of years ago, and it is my official summer wreath......for the pantry door, anyway! Do you want to see my simple summer mantel? season -- yep, that would be Fall, and I go just a tad bit crazy decorating for that and the following holiday. So, anyway, my simple summer mantel is just that, simple. The chalk art is a Free download from Erin at Home With the Boys. The natural patina copper tray is actually one I have used in the past for plants. Now it holds some little jars (they use to hold faux flowers in my craft room), some shells from our summer vacay and what I think are suppose to be peonies -- something else that doesn't grow here in the desert! Battery-operated candles flank each side of the tray. More of those peony-ish faux florals in a sweet little turquoise bird planter. Simple vignette on the game table. However you are celebrating this 4th of July, please be safe, stay cool, have tons of fun with your families and friends, and remember why we get to celebrate this holiday! This little white buffet where I have been storing extra glassware and some china. Oh, also the lower part of my china hutch got involved in the fun, too! Hey everyone! First, I would just like to say a big "THANK YOU" to all of you who have left me such sweet comments and virtual hugs over the last couple of weeks! You were all so compassionate when I blogged about our son and family's plan to move and then their actual departure. That was much harder than either The Man or I expected. So this past week we just kind of took things slow and easy. As I posted on Saturday, it was our 45th Wedding Anniversary. We don't feel the need to have big celebrations or buy elaborate gifts -- we love each other and have no need to prove that to ourselves or anyone else. That being said, we did go out and do a bit of shopping......lol! I really needed a new wallet but always put off buying one until I'm totally frustrated with my existing one. I think selecting a new wallet is much harder than it should be -- at least for me! This one kind of beckoned me from the get-go with that pretty turquoise color, and it pretty much fit my criteria for the inside, too -- WIN-WIN! I was definitely not planning on a new purse, but this navy and white just jumped out at me. I think it's the perfect summer purse! And BTW, The Man also got a new wallet and some new slippers; they just didn't make the cut for a cute pic! We also made a stop at TJ's for some flowers -- aren't they just bright and cheery? Yesterday, being Father's Day and the first one without any one around but me, was pretty difficult for The Man. So we decided to combine our Anniversary and Father's Day and go have a really nice meal at Stuart Anderson's Black Angus Steakhouse. That was a very good choice! I did do a bit of tweaking in my living room and dining room this past week and will share that in a day or two. Oh, and The Man is working once again on finishing our closet, so.......one day soon, I hope, I'll be sharing that. Hope y'all have a great week! Hey everyone! It's not a good way for a Nana to start the week, at least not this Nana. Today was "D" Day -- Departure Day for our son and his family. I (we) are going to miss these guys so much! They buttoned up their house on Sunday and left it in the hands of their realtor, then came over here late in the afternoon. We played, had a tea party, filled up on Nana's lasagne, watched "Frozen," and got in lots of hugs and snuggles (I can never get enough of those), & went to bed knowing that this morning would come all too soon. Sweet and bubbly even at 4:30 this morning! today just feels so final. I managed to hold it together until those final hugs and kisses as they got into their car this morning to leave for the airport. This Nana's restraint was done! Don't get me wrong, I (we) are thrilled for this new adventure and opportunity for this sweet family, but our hearts are truly aching right now. The sight of this on the breakfast room table brought new tears as I think of those sweet little hands holding the tiny teapot and cups so carefully. Perhaps I should put this little set away and out of sight for awhile. It's truly a bitter-sweet time for The Man and I. We will eventually only have gladness in our hearts, but for today, tomorrow, and probably for the foreseeable future, our hearts are very sad. This will be my last post for awhile, but I will return with a lighter mood -- I hope! Thank you for indulging my sadness, and I hope all of you have a wonderful week! Hey everyone! I hope y'all had a wonderful weekend. So tell me, are you ready for some random ramblings, because that is exactly what I've got today. We are really starting to heat up here -- 105* over the weekend and 109* predicted for today -- yikes, right? The Man and I got out early on Saturday morning and did some yard cleanup. He trimmed the Mesquite Tree and I dead-headed and cleaned up the pots. The Man has been babying this tree for a couple of years now, since we lost one of the big branches during one of our crazy Haboobs! It's looking pretty good now. they will be ready for blooming again this Fall! My herb pot has been very abundant this Spring and needed quite a bit of trimming. I decided to make a bouquet for the breakfast table -- smells delicious! a bit of decorating the last time they were here! Silly me, I alway use those tassels for lamps or candlesticks! Whoever came up with this system, is a genius! So, what did we see? 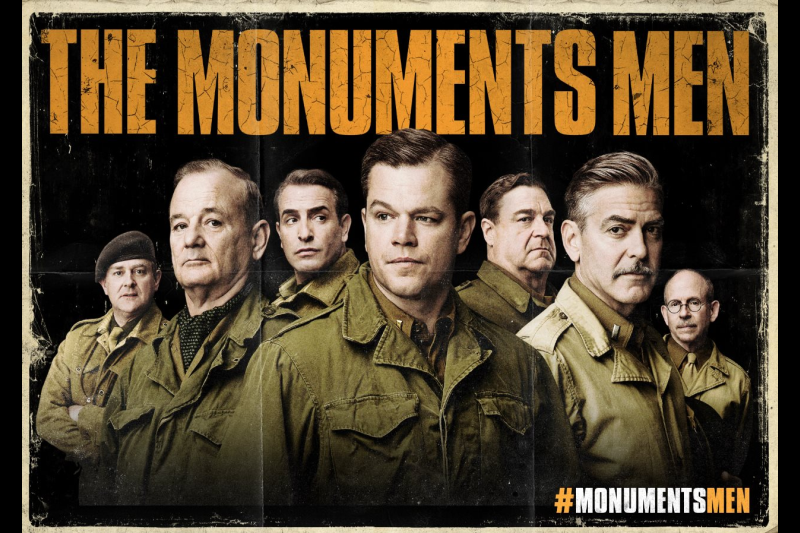 Monuments Men -- The Man and I both really enjoyed this movie! 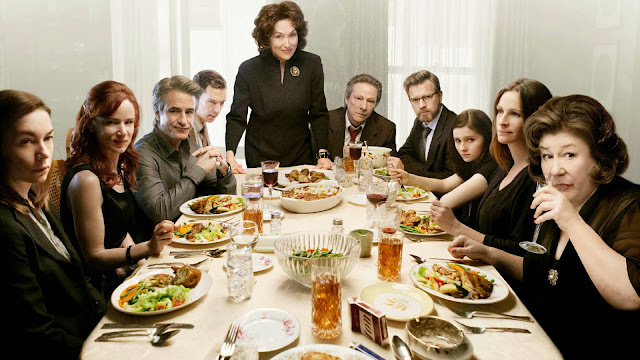 August: Osage County had some incredible acting, but was very dark in its content. We can all only hope that we do not have families that are this volatile. If you have a real aversion to "potty-mouth" language, then this movie is not for you. It was very hard to take at times. 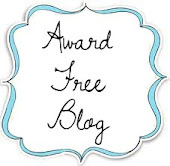 Jennifer Carroll's new online magazine "Celebrating Everyday Life," and I was one of the lucky winners. This is really a very lovely magazine. Thank you so much, Robin! As much as I enjoy the ease of reading a book or magazine on my iPad, sometimes a piece of work comes along that you just know you have to be able to touch and hold in your hands. A book that will have notes written in the margins and passages highlighted with a marker. A book that will get dog-eared and show signs of much love. This is just such a book. "Giving Up on Perfect......Instead of giving up on a perfect idea, what if you gave up on perfection? Giving up is the first step to creating the home you love. The goal of perfection does nothing but hold you back." I thought, "Wow, is this ever true.....at least of me." I am a perfectionist and many times it holds me back from doing and trying so many things. I'm feeling such renewal from this book and seeing ways for me to just breath and let go -- okay, I know this won't happen overnight and will take some effort, but I'm truly seeing some possibilities for positive changes. Yes, I highly recommend this book! When the weather starts heating up around here, I spend more time in my craft room. Becky Higgins' Project Life core kits. There were several methods that looked interesting, but organizing predominantly by color sounded like the best fit for my style of scrapping. I have several kits and had been using them separately which was kind of boring and frustrating. After combining all of my kits and separating by color, I found that I had so much more fun putting my pages together. I loved how quickly these photos of our Memorial Day weekend activities and our "California Cruisin'" vacay, came together in these pages. The containers I used are from IKEA, and I had picked up several of these when I bought my Raskog cart. They fit perfectly in the cart, BTW! The other thing I like about this new system is how easy it is to move the plastic bins back to the Raskog when I need my crafting table for something else. The Man and I also had a morning date here. UGH....I don't like it, but I do it anyway! I truly hope you will all have a wonderful week, do some fun-stuff, and make memories!